adaptiveMethod Adaptive thresholding algorithm to use, see AdaptiveThresholdTypes. The BORDER_REPLICATE | BORDER_ISOLATED is used to process boundaries. 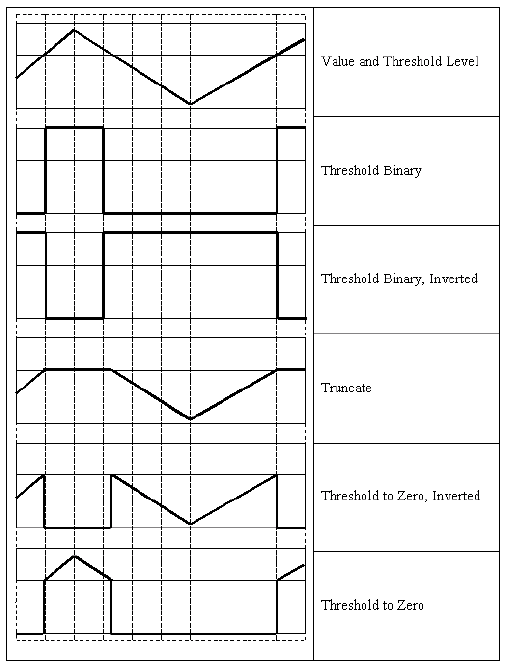 thresholdType Thresholding type that must be either THRESH_BINARY or THRESH_BINARY_INV, see ThresholdTypes. src1 It has a type of CV_8UC(n) or CV_32FC(n), where n is a positive integer. src2 It has the same type and size as src1. weights1 It has a type of CV_32FC1 and the same size with src1. weights2 It has a type of CV_32FC1 and the same size with src1. dst It is created if it does not have the same size and type with src1. maskSize Size of the distance transform mask, see DistanceTransformMasks. DIST_MASK_PRECISE is not supported by this variant. In case of the DIST_L1 or DIST_C distance type, the parameter is forced to 3 because a \(3\times 3\) mask gives the same result as \(5\times 5\) or any larger aperture. labelType Type of the label array to build, see DistanceTransformLabelTypes. maskSize Size of the distance transform mask, see DistanceTransformMasks. In case of the DIST_L1 or DIST_C distance type, the parameter is forced to 3 because a \(3\times 3\) mask gives the same result as \(5\times 5\) or any larger aperture. mask Operation mask that should be a single-channel 8-bit image, 2 pixels wider and 2 pixels taller than image. Since this is both an input and output parameter, you must take responsibility of initializing it. Flood-filling cannot go across non-zero pixels in the input mask. For example, an edge detector output can be used as a mask to stop filling at edges. On output, pixels in the mask corresponding to filled pixels in the image are set to 1 or to the a value specified in flags as described below. Additionally, the function fills the border of the mask with ones to simplify internal processing. It is therefore possible to use the same mask in multiple calls to the function to make sure the filled areas do not overlap. flags Operation flags. The first 8 bits contain a connectivity value. The default value of 4 means that only the four nearest neighbor pixels (those that share an edge) are considered. A connectivity value of 8 means that the eight nearest neighbor pixels (those that share a corner) will be considered. The next 8 bits (8-16) contain a value between 1 and 255 with which to fill the mask (the default value is 1). For example, 4 | ( 255 << 8 ) will consider 4 nearest neighbours and fill the mask with a value of 255. The following additional options occupy higher bits and therefore may be further combined with the connectivity and mask fill values using bit-wise or (|), see FloodFillFlags. mask Input/output 8-bit single-channel mask. The mask is initialized by the function when mode is set to GC_INIT_WITH_RECT. Its elements may have one of the GrabCutClasses. The function applies fixed-level thresholding to a multiple-channel array. The function is typically used to get a bi-level (binary) image out of a grayscale image ( compare could be also used for this purpose) or for removing a noise, that is, filtering out pixels with too small or too large values. 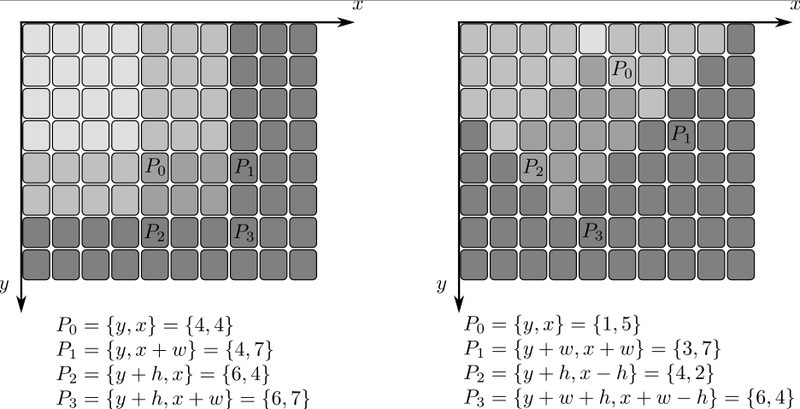 There are several types of thresholding supported by the function. They are determined by type parameter. Also, the special values THRESH_OTSU or THRESH_TRIANGLE may be combined with one of the above values. In these cases, the function determines the optimal threshold value using the Otsu's or Triangle algorithm and uses it instead of the specified thresh. Currently, the Otsu's and Triangle methods are implemented only for 8-bit single-channel images. type thresholding type (see ThresholdTypes). the computed threshold value if Otsu's or Triangle methods used.